These are really delicious and go great with fresh home made spaghetti and vegan organic wine. Put the warm water in a bowl, add the sugar and the yeast and allow to grow in a warm place for 5 minutes or until bubbly. Place the flour, and salt in a bowl and mix so that the salt is mixed in with the flour. Pour the water and yeast over, add oil and mix well using a blender. Allow to rise in a warm area with a clean towel over the top. Allow it to double in size, that will be about 1/2 an hour to 45 minutes depending upon the temperature. When the dough is ready, turn it out on a lightly floured surface and kneed it lightly. Sprinkle the baking powder over the dough and kneed a bit more to even the mixture. Take a small handful (about 2 tablespoons in amount) of the dough and roll it out as a “fat snake”. Make a small circle and bring the last end through the hole thus making a knot. Bake in a preheated 450 F / 232 C oven for 15-20 minutes or until lightly golden brown. While the knots are baking, prepare the garlic butter. Melt the vegan margarine and olive oil in a small sauce pan. Add the minced garlic, but keep the heat low, as you do not want to brown the garlic. Add the rest of the seasonings and keep the mixture warm. 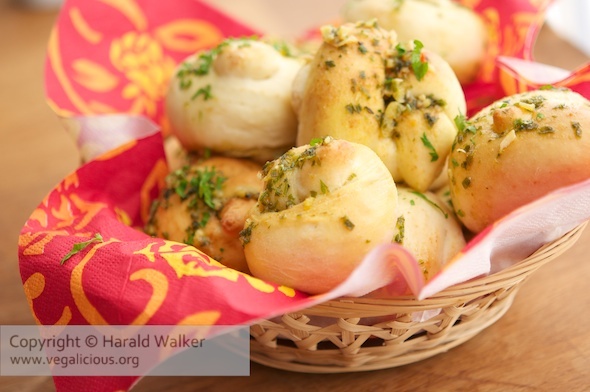 When the knots are done, remove from the oven and drizzle the garlic “butter” over each of the knots. Sprinkle extra minced parsley as a garnish. Posted by Chris Walker on July 1, 2011 in Breads and Muffins, Garlic.